The promoted pieces (not shown here) look like a cannon (+P) and a bird of prey (+Fa). WinBoard does not have bitmaps for Shogi-style kanji pieces for Tori Shogi, but of course masochistic users that would want these can define their own piece images in WinBoard (through a true-type font). BTW, the repetition rule mentioned here sounds suspect. (And I could not recognize it in a Google translation of the Japanese Wikipedia, which is even more suspect.) 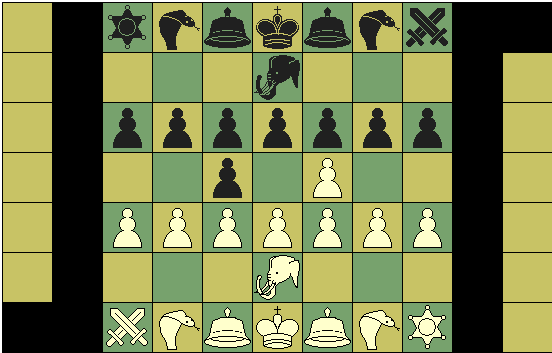 It would imply that a side who starts 'perpetually' checking will win the game, as when the position where his opponent was in check for the first time will finally materialize for the third time, the checked side must now vary, and consequently sacrifice his King, when he is no longer allowed to repeat the only safe evasion. This is very un-Shogi like (and percieved as rather unsatisfactory by orthodox Chess players as well). The engine + WinBoard (plus another engine, HaChu) is available in a package that supports 7 Shogi variants: Dai, Chu, Sho, regular, Tori, Judkins and mini-Shogi (plus Makruk, Shatranj and Chess-without-castling).